Heavy rains have been reported in a number of Indian cities, leading some to believe that monsoon season had arrived early. The India Meteorological Department (IMD) had earlier predicted that monsoon would hit the capital New Delhi on June 29, but large parts of the city have been experiencing light to moderate rainfall since Sunday morning. 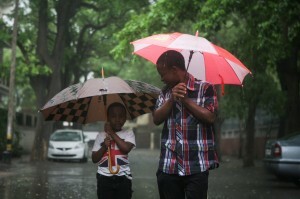 Scattered showers are to continue till tomorrow, according to the country’s weather office. “The temperature has also gone down heavily much to the relief of many from the scorching summer heat. Monsoon has arrived virtually in northern India as many states in the region have been lashed by heavy rains ahead of schedule,” a senior official said. Cities such as Mumbai have ground to a halt. Many low-lying areas in Mumbai and suburbs were flooded due to the continuous heavy rains accompanied by gusty winds with several sectors reporting up to three feet of flooding waters. Authorities said that at least 10.5 cm of rain had fallen by mid-afternoon on Sunday. The IMD has forecast heavy rains for Mumbai and surrounding areas for the next two days. The meteorological centre is also expecting winds of up to 50km an hour. Meanwhile, many areas of Punjab and neighbouring Haryana states were also hit by heavy rainfall Sunday. The monsoon is now expected to arrive in Punjab and some parts of Haryana in a day or two, nearly ten days ahead of its expected landfall, an official from the weather centre said.